The booklet ' Activities and the battle against dementia' has been written from the author's experiences derived from caring directly for people suffering from Alzheimer's disease and varying degrees and types of dementia, along with his own reading and research into these illnesses. In his spare time, he assisted his wife Nicky a District Nursing Sister, in the running of a residential care home in Barnet, Hertfordshire as an Activities Co-ordinator. so vulnerable and completely dependent on them. ZigZag Education is a Bristol-based UK educational publisher of teaching resources for schools and colleges including Care Home resources. 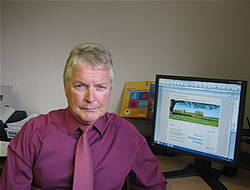 'It is hoped that all those involved in the care of people suffering from dementia will find this resource useful and supportive in their daily on-going efforts to look after them, and that the resource can help all involved to appreciate and understand how and why sufferers of dementia behave in certain ways, and how to cope with them in difficult and trying situations. Encouragement and support to take part in any activity should be given gently and tactfully but at no time should any activity be imposed on a person who may wish to be left in peace and quiet and watch what's going on whilst remaining at rest as a spectator.